Lucy the Dog | Disability Independence Group, Inc.
Lucy is our litigation support dog and our therapy dog-in-training. 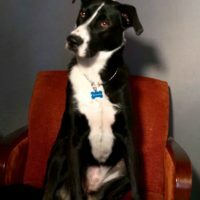 She is a three year-old great dane/border collie mix, and enjoys sitting in on meetings and conference calls. On a more serious note, she provides a well needed break during the day and is available for playtime, walks, and pets when needed. When guests give her treats, she serves as a comfort animal during meetings and depositions.